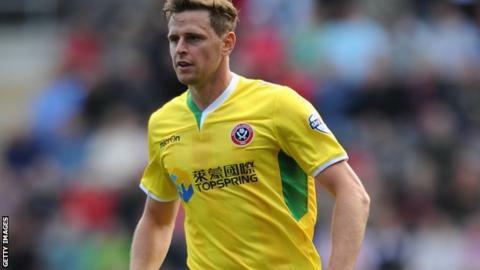 Sheffield United's Chris Porter scored a late equaliser to grab a point at former club Oldham, who are now unbeaten in nine League One games. Both sides were guaranteed a mid-table finish before kick-off, but Oldham were livelier and led when James Wilson met Connor Brown's cross to head in. The Blades improved after going behind and Conor Coady slotted home on 43 minutes, only to be ruled offside. Their goal came when Porter turned in Jamie Murphy's low cross. "You've got people like John Brayford that has gone for a lot of money, and they bought Jose Baxter for us. "They're a big club and I was pleased because we're punching above our weight. They're a giant and we're a little gnome throwing a spear at them. "We held our own tonight. I was very pleased with my team." Match ends, Oldham Athletic 1, Sheffield United 1. Second Half ends, Oldham Athletic 1, Sheffield United 1. Corner, Sheffield United. Conceded by Paul Rachubka. Attempt saved. Michael Doyle (Sheffield United) left footed shot from outside the box is saved in the top centre of the goal. Foul by Chris Porter (Sheffield United). Korey Smith (Oldham Athletic) wins a free kick in the attacking half. Attempt missed. Danny Philliskirk (Oldham Athletic) right footed shot from the left side of the box is close, but misses to the left. Attempt missed. Jamie Murphy (Sheffield United) right footed shot from outside the box misses to the left. Attempt missed. Adam Lockwood (Oldham Athletic) header from very close range misses to the left. Connor Brown (Oldham Athletic) wins a free kick on the right wing. Substitution, Sheffield United. Billy Paynter replaces Jose Baxter. Goal! Oldham Athletic 1, Sheffield United 1. Chris Porter (Sheffield United) right footed shot from very close range to the centre of the goal. Assisted by Jamie Murphy with a cross. Corner, Sheffield United. Conceded by David Worrall. Attempt missed. Charlie MacDonald (Oldham Athletic) right footed shot from the right side of the six yard box is close, but misses to the left. Carl Winchester (Oldham Athletic) wins a free kick on the right wing. Jamie Murphy (Sheffield United) wins a free kick in the attacking half. Substitution, Oldham Athletic. Carl Winchester replaces John Kissock. Substitution, Oldham Athletic. Danny Philliskirk replaces Gary Harkins. Attempt blocked. Jose Baxter (Sheffield United) right footed shot from the left side of the box is blocked. Harry Maguire (Sheffield United) wins a free kick in the attacking half. Foul by Charlie MacDonald (Oldham Athletic). Substitution, Sheffield United. Chris Porter replaces Conor Coady. Attempt missed. Harry Maguire (Sheffield United) header from the centre of the box is close, but misses to the right. Attempt blocked. Conor Coady (Sheffield United) left footed shot from the centre of the box is blocked. Terry Kennedy (Sheffield United) hits the bar with a header from the centre of the box. Hand ball by John Kissock (Oldham Athletic). John Kissock (Oldham Athletic) wins a free kick in the defensive half. Hand ball by Korey Smith (Oldham Athletic).